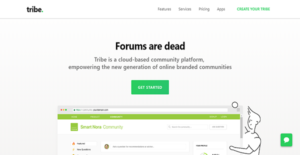 Tribe is a flexible community engine that renders traditional online forums obsolete. It is highly user-centric and meets the needs of your business and your audiences. Since it is a space for your brand and members of your community, it is fully customizable, allowing you to use your own domain and adjust the interface’s design as you see fit. Moreover, Tribe has an engaging social dimension. It enables users to explore topics, follow threads, post queries, and initiate discussions. Apart from these, users can also perform a wide variety of social actions like commenting, sharing, and upvoting. Tribe conforms to the needs of your brand. That is why it is designed to be adaptable and flexible. This way, you can build a community that suits the needs of your business and of your consumers. Additionally, Tribe allows you to integrate it with your main website or with your product domain. As a result, it is easily accessible to your audiences. While Tribe has a host of theming tools that let you visually arrange your community site, it also gives you access to widgets and APIs as well as webhooks and RSS feeds. With these, you can extensively customize your community forum and connect it with your mobile app. Tribe has a slew of integrations available in its app marketplace. The list includes CRMs, chat apps, analytics tools, and e-commerce platforms. You can also synchronize the platform with Zapier to ease the flow of information further. Though you can control what spaces in the website users can access and what actions they can execute, Tribe Platform still provides you with moderation powers. By moderating posts, you can ensure healthy conversations within your community site. As a result, you can address user needs efficiently and highlight and resolve important issues. Unlike other community builders, Tribe is easy to configure. As such, you can immediately go live and onboard your existing community members as well as draw in new ones. What Problems Will Tribe Solve? Keeping users engaged on the platform is easy since you can afford them a personalized feed. There is also a gamification and incentivization system that can result in higher retention, loyalty, and revenues. With Tribe, you can ask users to create content that you can use for marketing. This also enables you to build connections and a network of referrers who can help you acquire new users and grow your business. Using Tribe, you can build an honest and trustworthy brand. By congregating users into a community, you can set the tone of discussions. Each enterprise has its own characteristics, and can need a special Online Community Software solution that will be adjusted to their company size, type of customers and employees and even particular niche they deal with. We advise you don't count on finding an ideal services that is going to work for each company regardless of their background is. It may be a good idea to read a few Tribe reviews first and even then you should remember what the solution is supposed to do for your business and your staff. Do you require a simple and intuitive service with only essential functions? Will you really make use of the complex functionalities required by experts and big enterprises? Are there any particular features that are especially practical for the industry you work in? If you ask yourself these questions it will be much easier to get a reliable service that will match your budget. Tribe Platform has three choices for enterprise pricing that are billed annually. Check the details for these below. We realize that when you make a decision to buy Online Community Software it’s important not only to see how experts evaluate it in their reviews, but also to find out if the real people and companies that buy it are actually satisfied with the product. That’s why we’ve created our behavior-based Customer Satisfaction Algorithm™ that gathers customer reviews, comments and Tribe reviews across a wide range of social media sites. The data is then presented in an easy to digest form showing how many people had positive and negative experience with Tribe. With that information at hand you should be equipped to make an informed buying decision that you won’t regret. What are Tribe pricing details? What integrations are available for Tribe? If you need more information about Tribe or you simply have a question let us know what you need and we’ll forward your request directly to the vendor.